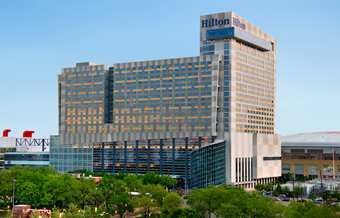 In an effort to even further reduce their carbon footprint, Hilton Americas-Houston, the city’s largest hotel and first Green Seal certified hotel in Texas, is now even greener with the installation of the AquaRecycle water recycling system in the hotel’s laundry. The laundry facility, covering 27,000 sq. ft. and rivaling most commercial laundry plants in both size and capacity, is by far the largest hotel laundry in the city, washing and finishing over 675,000 pounds of linens per month. The two massive Lavatec tunnel washers wash 100 pounds of linens every two and half minutes, with a maximum working capacity of 5,550 pounds of linens per hour. 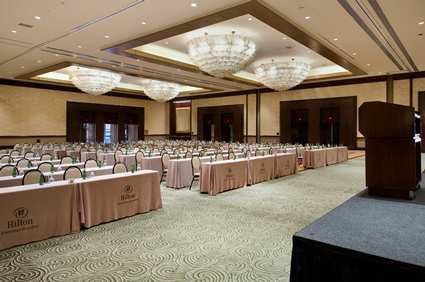 With the installation of the AquaRecycle water recycling system, Hilton Americas-Houston’s pre-installation water usage of 630,000 gallons per month is reduced by 75%, conserving over 5.5 million gallons of drinking water per year and keeping the same amount of wastewater and associated toxins from entering the environment through the local wastewater treatment plants. Water returned to the washers through the AquaRecycle system maintains its temperature at 120 degrees, achieving significant energy savings by eliminating the need to heat cold water to the required wash temperatures. These savings are reflected not only monetarily in lower natural gas bills, but also environmentally by preventing over 260 metric tons of greenhouse gases in the form of CO2 from entering the atmosphere.